Travel with Kevin and Ruth! : Happy Easter! Well, Easter is a lot more fun with little kids about hunting for their Easter eggs! And sure enough, the Easter bunny came at some point overnight. 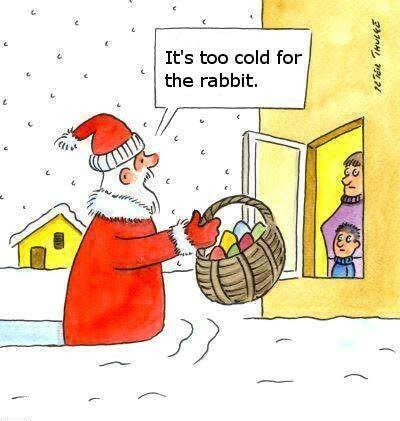 But the Easter bunny almost couldn't make it through the snow! Sadie wasted no time getting into her chocolates! Hey, look what the Easter bunny brought. Our daughter Lindsey and her husband Justin are off to Cuba today for a week away. Good for them, because it sure has been a long cold winter here. And it's apparently not over yet. Last night was absolutely miserable, with cold, snow and wind, and ice pellets. Yuck. Taken out the back window yesterday evening. At least the sun is shining, but it's still cold. Only -6C (21F) out there just now. Anybody like gluten free Chex cereal? It's on sale dirt cheap at Amazon.com... $10.61 for a 4 pack...that's only $2.65 per box! Hey! Happy Easter! Hope the "kids" have a blast in sunny Cuba. And here I was grumbling last night when I saw a couple snow flakes. Crikey. I am sure they will and they will be so happy to get a break from this weather! Spring has forgotten to come to this area, this year. Yes it really was and that was the second time in a row that we have spent Easter with them. Last year they came to visit for a week at my Dad's when we were there to pick up Little Blue Car from storage. Those sure are cute kids and what a view. I might like to play in all that snow for about a week although 21 is a bit chilly for playing. Is that the high or the low? If it wasn't so cold and windy we might be out there playing in the snow too! Hard to believe it is April here. 21F was pretty much the low for the day, the high was about 36F. Sadie looks quite a lot like Ruth in that last picture! Looks like a great hunt. Ours is this PM:) Happy Easter! Hope you hunt was a fun one too! Now that Sadie is one cute little bunny. I love seeing her try to fit in the basket. What a hoot. Thank you Leslie, they really are the greatest! She will love that one when she is 21. We would have thought all the snow would have been done and gone by now too but somehow I think Mother Nature forgot about this small part of the world when it came to spring weather. Makes me think we are in Disney's fairy tale movie called "Frozen"! Happy Easter to you both. I'm glad we are passed the snowy season here but my allergies are horrible. Have fun babysitting.